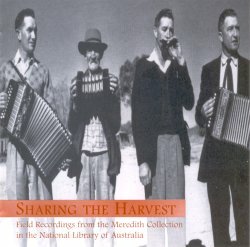 Since discovering the National Library of Australia's Sharing the Harvest about a year ago, that double CD has been a particular favourite of mine. Containing songs and instrumental tunes (99 tracks in total) from John Meredith's 1950s field recordings, this is an excellent selection of the old bush-style singing, recitations, British ballads and dance music (and it's still available through the National Library of Australia). Personally, it presented an opportunity to hear the classics of Australian traditional folk music - for which the original 1950s vinyl releases and later cassette compilations are now all but unobtainable - and also a chance to hear antipodean singing accents in English close to that of my native New Zealand (from which no such releases of field recordings have emerged). The magnificent performances of Edwin Goodwin, Sally Sloane, and Duke Tritton were all there, plus good surprises, like Ernie Sibley's bizarre recitation Snakes. One of the small problems of Sharing the Harvest though, was its lack of background information about the performers and the songs in the liner notes. This was solvable by consulting the 1967 book Folk Songs of Australia and the Men and Women Who Sang Them (John Meredith and Hugh Anderson), which documented the life stories and music of all the performers. But would everyone who bought the CDs know this, or even be able to get a copy of this out-of-print volume? Undeterred by this problem - and lured by the prospect of songs from Sally Sloane - I checked out the National Library of Australia's website at: www.nla.gov.au to see what I could find out. What I discovered was that I could buy the double CDs with a credit card for $24.14 Australian - so I did. What I didn't know was - even approximately - what $24.14 Australian equalled in Sterling. You may be surprised to hear that the discs arrived about one week later, and that when my credit card statement subsequently turned up, I found that I had got a double CD containing 99 tracks of hitherto virtually unobtainable traditional singing and music (much of which is of admirably high quality), sent airmail from the other side of the world, for the sum of just £10.16 !!! So this isn't really a review of Sharing the Harvest, but a simple statement that you must be barking mad if you don't go to the Library's website immediately and get yourself a copy!